What’s not to love about that hook? It’s what got me. I didn’t even read the inside cover for this book. I just dove in. Gunslinger Girl is Wizard of Oz as a western – in a good way. The story takes place in a world of tomorrow – one rifled by the Second Civil War. Pity runs away from her commune life and ends up in the glittering, lawless world of Cessation, where Selene’s word is the only law. It had all the glitter and dirty romance of a tavern with a swing gate and a self-playing piano, only of the future. Gunslinger Girl begins as a quest for freedom and a place to call home, but then it turns into a political game-drama about three-quarters through. That, to me, didn’t quench my thirst for a story. It felt more like a web set-up by the adults of the story that Pity had to navigate – she didn’t really do anything to advance the story. She reacted to things done by others. Pity’s emotional struggle with murder, guilt, and love had me hooked. At times she felt whiny, but she’s a seventeen year old girl thrust into a new world of high stakes. The story itself felt dragged – the beginning seemed to go on forever, and the climax seemed to go on forever. The middle was fun and kept me reading, but the ending and the beginning made me want to skim. The beginning had moments of exposition that I didn’t feel were necessary, mostly about the altered history of North America. Given that the history didn’t play that much into the overall story, it felt more like forced exposition. Now, I admit, I’m not the biggest fan of dystopias. If I were, this book would have gotten a perfect score from me. It just didn’t invite me back to the book. If it had taken place in some fantasy world with assassins and thieves instead of gangs and politicians, I would have enjoyed it more. 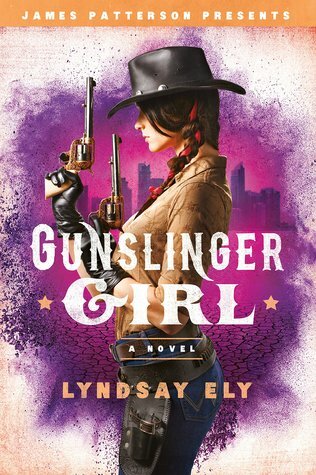 Overall, I gave Gunslinger Girl by Lyndsay Ely a 4 out of 5. This story felt like a western, but with more of a YA flare. I loved the characters, the world, and the writing, and although it didn’t pull me in as much as others, it was still a highly enjoyable read. Fans of the Hunger Games should give this book a shot. I’m super excited to read this book! Lynsday is such an awesome person, and I have a signed ARC on my shelf waiting to be read! Great review! Oh! Can you feel my jealousy radiating through my words? Because it’s there. A solid 85 degrees F.
Haha thank you! If you’re interested, I had the amazing opportunity to interview Lynsday on the blog! She’s great! I’m so glad you enjoyed Gunslinger Girl!